for all your frozen sectioning needs. Legendary performance - Incomparable results! OTF is designed for optimum efficiency, versatility and consistent quality. 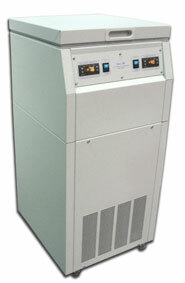 The only cryostat with dual parallel compressors. A broad range of accessories and options allows the user to custom configure the OTF to meet their specific needs. Typical applications include Histochemistry, Neuroscience,"Whole Body" Studies, Autoradiography, Immuno-Histochemistry, Materials R & D, Immuno- Fluorescence as well as Routine Surgical Pathology. Frozen sections anytime, any place! The only truly portable cryostat. Not since microtome cryostats were first introduced has there been an innovation like Micro 2212... Imagine: A microtome weighing under 5 lbs., that can be moved in out of the chamber in 10 seconds; in a cryostat weighing only 81 lbs. All professional facilities for surgical pathology are provided, including programmable auto-defrost, freezer bar, digital temp displays, automatic advance and anti-roll device and unique, magnetic, disposable blade holder. The CLINI-RF is a new freezer designed to rapidly freeze specimens for sectioning or processing. The main benefits of the CLINI-RF are that it eliminates the need to use CO 2 and LN 2 , thus also eliminating the need to purchase and store these potentially dangerous substances. The instrument is a free standing unit providing a -80 E C tank which can be used as a liquid bath for rapid freezing by direct immersion in isopentane or with a solid aluminum freezer block to freeze specimens directly onto cryostat object holders. The CLINI-RF also incorporates a -30 E C freezer area for short-term storage of frozen specimens. Use of cryostat microtomes to prepare frozen sections for microscopy is widely known. Bright has been specializing in this field for more than 40 years. But for some applications these cryostats or simply not large enough or powerful enough. It is for these cases that the Bright 8250 and 9400 Cryostats from Hacker are ideal for incomparable performance for special research applications. 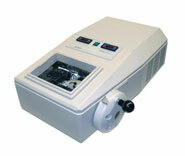 For fast, easy and affordable frozen sections, this solid state freezing device can be used with any microtome. Freezing stage available in two sizes for standard rotary, sliding and freezing microtomes or for large sliding microtomes. 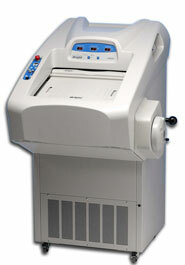 Also available with automatic temperature control via micro probe needle and readout unit. Unique specimen freezer - not simply a “cold spot” inside the chamber, but an insulated work station for tissue preparation. Microtome - specially designed for easy trimming and reliable sectioning; the 3020 microtome has a radial, flat cutting action. Anti-roll system is fully adjustable for optimal results with different types of knives. Easy to clean chamber and one-step method to remove or install microtome. Automatic defrost ensures efficient refrigeration and convenience of use. Fully programmable to suit laboratory hours.